As the nostalgic reminiscences in this book recall, life in Jewish Gush Katif was a modern expression of the Zionist spirit. These were vibrant settlements which developed agriculture, industry, and a strong sense of community. As the bitter tales of forced evacuation document, "Disengagement" was a tragic mistake forced upon an unwilling population, which was denied democratic recourse to appeal. The historic days of Gush Katif are told almost in the spirit of Paradise Squandered. It was the good life, in every sense of the term. People came with dreams, and the government encouraged them. By 2004 there were 20 settlements (17 religious) with five schools and six yeshivot, a seminary for girls, agriculture and industry. 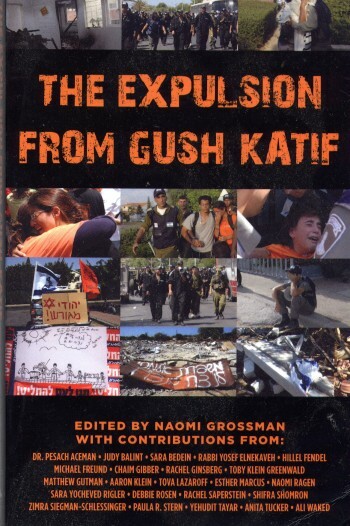 Then came the incredible order that Gush Katif would be evacuated. It was too startling to believe. Few packed their belongings. Few could understand that the order to leave was serious. For those who tell their stories in this book, it was the beginning of a nightmare that still has not ended. On 17 August 2005, after the essentially non-negotiable Israeli government decision, Jewish Gaza was evacuated. IDF soldiers and Israel Police officers dismantled more than 25 years of building. Many of the uniformed Israelis were in tears as they complied with orders from commanders. People were forced to leave with little if any regard for their belongings. Unfortunately, this book concentrates on personal stories. They are heartbreaking. They are emotional. But, they are crying over spilt milk. Gush Katif is lost. The battle is over. Worst of all, lessons were not learnt. One must look forward to stop a repeat of the mistake. Senior Israeli politicians are still talking about the future dismantling of additional settlements in exchange for the illusion of peace. The rationale of the Sharon government was to show the Palestinians that progress in the peace process could be made without intervention from Iran. Here Israel was ceding land without any Iranian influence. It would be mild to say that the tactic backfired. Perhaps better put, it exploded in Israel's face. Not only were synagogues and houses destroyed. Not only were hothouses torn down. The once fertile fields of Gush Katif became the launching pads for rockets against Southern Israel. If the fingers of Iran did not pull the trigger, they certainly supplied weapons and aided with political support. Israel failed. As the book describes, many of the leaders of the time have admitted that they were wrong in supporting the "Disengagement" policy. In many ways that is now insignificant. What is more important is that many of the former Gush Katif residents still have not found permanent housing --- after more than three years of waiting and government red tape. Perhaps one of the biggest Israeli failures was in not preparing adequately for the evacuation. The stories in this book are vivid testimony to the lack of preparation for the day after --- What do we do with these people now? The book is repetitive. The book is emotional. Proofreading could have been better. But, the book provides excellent insight into the human side of a forced evacuation of Jews from Eretz Yisrael.